No doubt you’ve heard about programmatic advertising – and you may have even experimented with it. At NAS, we think 2018 will be the year when programmatic becomes an accepted standard in recruitment advertising. That’s why we’re introducing NAS MediaPro as our programmatic offering. 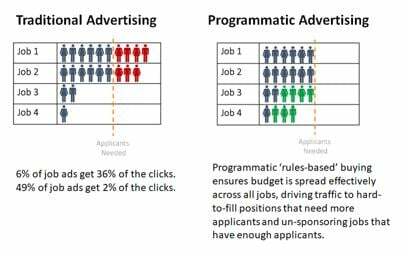 Programmatic buying utilizes a distributed network of job-related sites to optimize efficient targeting and placement of your job ads. Rules-based buying reduces spend on poor performing vendors, easy-to-fill jobs, runaway jobs and bad conversion rates. Keep in mind that programmatic buying still needs the right minds behind it to work. You need experts who understand recruitment marketing and can manage the buys, oversee your spend and make the right decisions to get the best results. That’s where our expertise comes in. With NAS MediaPro, your spend is managed by individuals with years of experience in recruitment marketing and a sound knowledge of the strategies needed to succeed. Ready to explore programmatic in 2018? We’d love to talk strategy and potential results with you. Get in touch and we’ll set up a call to discuss NAS MediaPro with you! Jennifer Henley is a trusted authority in recruitment solutions and consultative client services. She possesses the Professional in Human Resources (PHR) and SHRM-CP designations, is a proud member of MAHCR, NAHCR and SHRM, and is a featured speaker at HR communications industry conferences and events nationwide.